Inspired by Flemish still-life paintings, photographer Kyoko Fierro has created a stunning series of photographs and recipes featuring edible flowers. Here, she shares the recipe for Butter with Basil Blossoms. 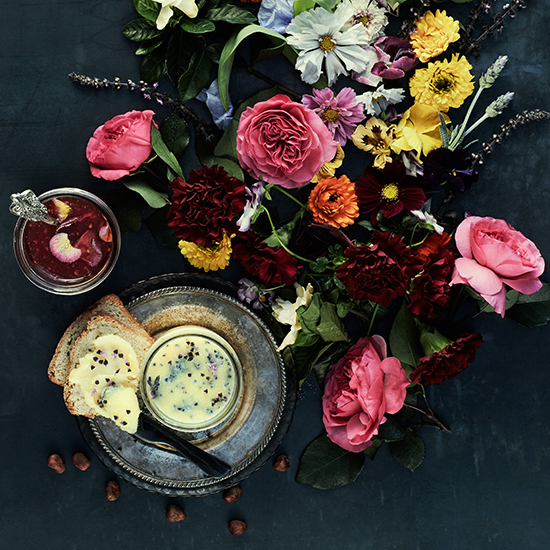 Inspired by Flemish still-life paintings, photographer Kyoko Fierro has created a stunning series of photographs and recipes featuring edible flowers. Fierro collaborated with food stylist JoAnne Strongman and chef Annabelle Choi to come up with a series of recipes featuring flowers like violets, cilantro blossoms, nasturtiums, roses and cosmos. Here, she shares the recipe for Butter with Basil Blossoms. Pour the warm clarified butter into a small bowl. Add sea salt and mix well. Place the basil blossoms carefully into the butter and stir gently to combine evenly. Pour the mixture into a small jar, bowl or container to maximize the visual impact of the basil blossoms. Chill in the refrigerator. Once the butter-basil blossom mixture is chilled, it will be ready to serve with assorted breads, crackers or crostini of your choice. Enjoy! *To clarify the butter: Cut the butter into squares and melt it slowly in a heavy-bottomed pan over low heat. Skim the foam off the surface with a shallow spoon. Strain the liquid slowly through multiple layers of cheesecloth into a heatproof bowl to remove the white milk solids. The clear yellow liquid is the clarified butter. Clarified butter is acceptable to most who have a lactose intolerance.